Thalassotherapia Crikvenica has huge needs for hot water and cooling in the summer months, when solar energy is the most available. 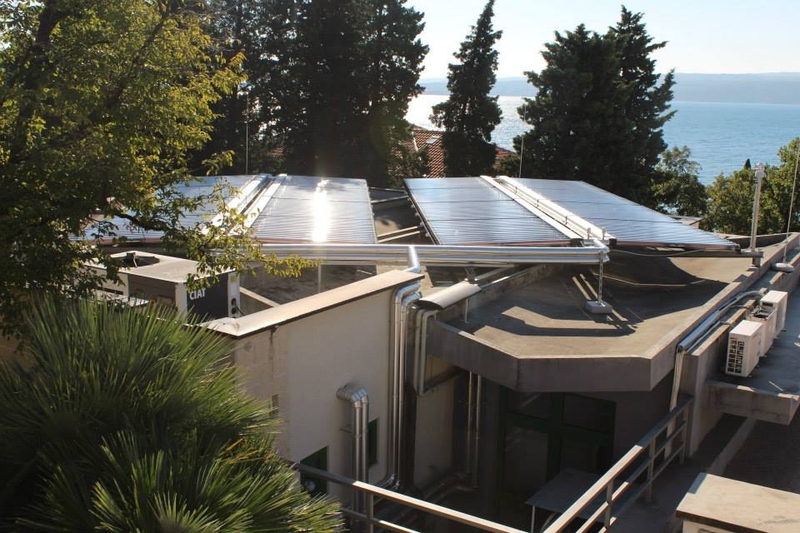 The aim of constructing a solar cooling system at its premises was to improve its cooling requirements, increase the share of solar energy in the hot water preparation for the purpose of medical centre patients’ rehabilitation and, at the same time, to save energy and achieve significant emission cuts. Air cooling was carried out by an absorption cooling device that works with a mixture of lithium bromide and water, with the cooling effect of 17 kW. Cooling was carried out by absorption cooling device that works with a mixture of lithium bromide and water, the expected cooling effect of 17 kW, with production of heat through vacuum solar collectors and distribution of energy for cooling via ceiling panels adapted to the existing suspended ceiling in the restaurant. There is possibility of using waste heat from absorption refrigeration machine during cooling period and heat production from solar collectors outside the cooling for the hot water usage. Because of the random character of the appearance of solar radiation, system has possibility to complement each other in terms that is possible to cool the restaurant from solar-powered systems and existing compression refrigeration machines. Absorption refrigeration machine (Yazaki, lithium bromide-water), solar collectors (Viesmann- Heat Pipe), pumps, heat exchangers (plate-CIAT), heat accumulators, boilers, water systems, piping, insulation, load-bearing structure, regulation apparatus and system for tracking and acquisition of the operating parameters required for energy balance. This demonstrative pilot plant was set up under project ADRIACOLD, co-financed by the European Union through the IPA Adriatic Cross-border Cooperation Programme.